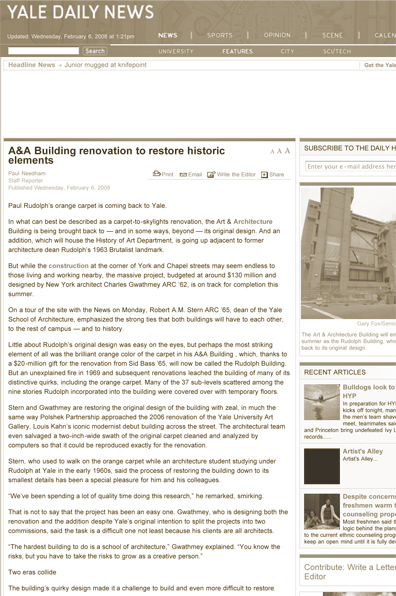 Paul Rudolph’s orange carpet is coming back to Yale. In what can best be described as a carpet-to-skylights renovation, the Art & Architecture Building is being brought back to — and in some ways, beyond — its original design. And an addition, which will house the History of Art Department, is going up adjacent to former architecture dean Rudolph’s 1963 Brutalist landmark. But while the construction at the corner of York and Chapel streets may seem endless to those living and working nearby, the massive project, budgeted at around $130 million and designed by New York architect Charles Gwathmey ARC ’62, is on track for completion this summer.